On the evening on Saturday, June 13th 2015. The Denis V. Cooper Foundation - Wishes For Heroes, granted it's "First Wish". Tony & Kelly Barrett alerted us to the needs of a local Military Veteran in need of a wish. Mark Corradino - MSGT, USAF. A Veteran of several tours serving our country in the middle east, Mark is battling several medical issues as well as the VA for appropriate benefits. 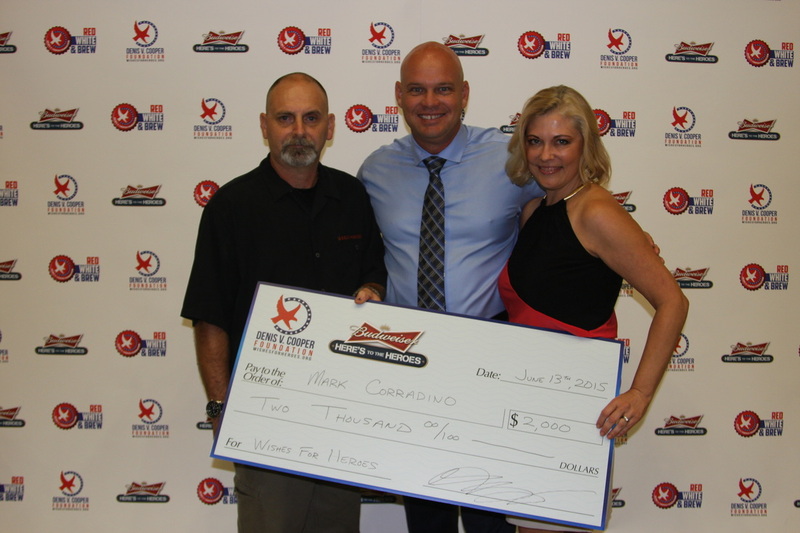 Mark Is shown here with friends Tony and Kelly Barrett with a check for $2,000 presented to him from Denis V. Cooper Foundation, to assist Mark with his wish for appropriate and needed housing for himself and his daughter. ​true local HERO. Lt. William Payne, US Navy. Lt Payne is in the early stages of Alzheimer's and needs to move with wife Betty to a facility to help with his care. After receiving no reply from Wounded Warrior, Injured Warrior or any other national organization, we were contacted. Thanks to our amazing donors, Denis V. Cooper Foundation was proud to present this check for $3,245 to Lt. William & Betty Payne of Bradenton. Front and Center is Lt. Milli Linn - US Army, a WWII Veteran who lives in Sarasota and was stationed at Pearl Harbor, just a year after It was attacked. Milli is 94 years young and still volunteers one day a week at our Sarasota National Cemetery. When we met Mill, we told her about our Military Wish granting Foundation. When asked if she had a wish we could grant, she said no. But then said yes, she wanted to a BBQ lunch for all of her fellow volunteers at the cemetery. Thanks to our generous donors and supporters, we were able to grant Lt. Milli Linn's Wish. Thanks to our amazing donors, we have been able to grant another wish to a local military family. Sgt. Tom Woodgeard - US Army, was recently diagnosed with a terminal illness. His wife Margie contacted us with a Wish Request. A trip to Tom's hometown of Lancaster, Ohio so Tom could see his family and friends. We were honored to provide this American Hero and his wife an all expenses paid trip last month to Ohio so they could see, hug and kiss the ones they love. Cpl. Seelie had an amazing time and wanted to share his sincere and humble thanks to everyone who has supported Denis V. Cooper Foudnation - Wishes For Heroes, and allowed his Wish to come true. 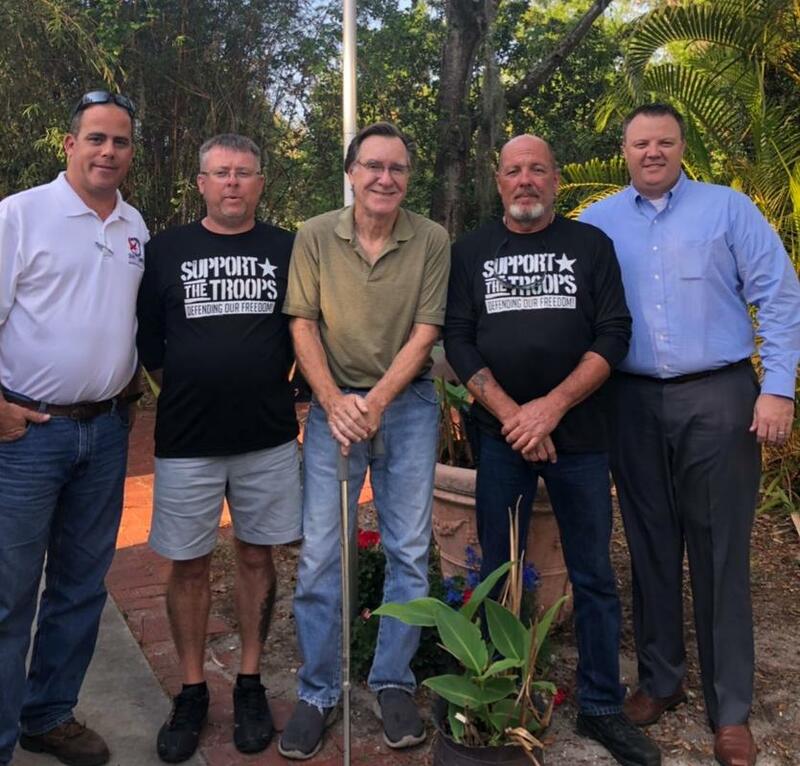 We received a “wish request” from a local US Army Veteran whose home sustained damage during Hurricane Irma. Through Insurance and the help of her friends, almost all had been replaced. The last item she was in need of, was a new mattress for her daughter. Thank you to Ricardo and his team of Thomas & Mike at Half Price Mattress Sarasota. They provided an awesome mattress at their cost to this family. All this was made possible by our amazing supporters and donors. Sgt. 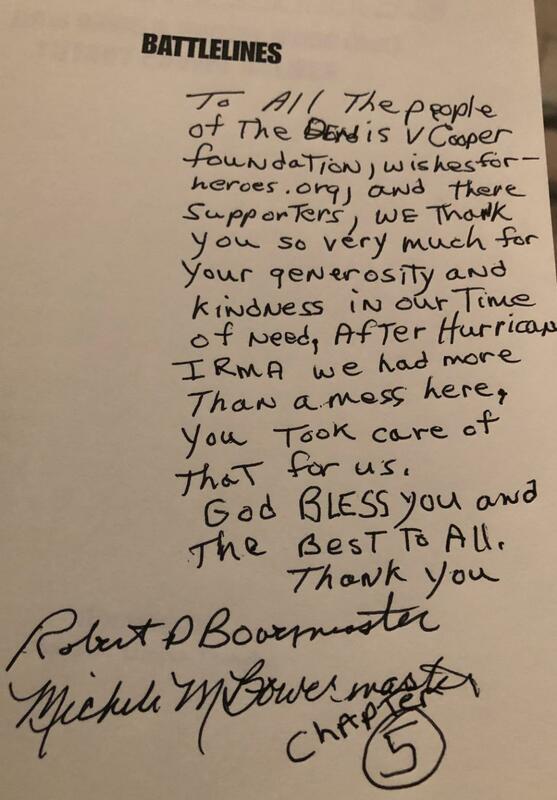 Bob Bowermaster - USMC, a Vietnam Veteran who lives in Bradenton had a lot of debris from several trees on his property associated with Hurricane Irma. LaVonne Bower with the fantastic non-profit www.PawsAndWarriors.org told us about Sgt. Bowermaster. We met with him in February. He had been cleaning up the debris of several very large trees by himself with a small chainsaw, since last September. Thanks to the amazing generosity of our donors, we able to grant this Heroes Wish and remove all the storm debris, as well as a few threatening trees. When we created Denis V Cooper Foundation, our goal was to help where we could. Meet Sgt. Clarence Addy, United States Air Force, a B-17 lower ball turret gunner in WWII, he flew many combat missions against Nazi Germany. Clarence is 94 years old and lives in Sarasota. His friend Dale Alyward nominated him to receive a “wish”. Clarence’s roof was in bad shape and needed to be replaced. Thanks to our wonderful supporters, we were able to grant this Heroes Wish. What a treasure he is. His personality lights up a room.